Uh oh! Your cat has just peed on the carpet in your much-used living room. Fret not! This is a guide on how to get rid of Cat Pee Smell. It’s very common for cats to pee inside your house, be it carpet, your bed or couch when they are not properly toilet trained, but believe me getting rid of cat pee smell. Its stains are no fun, if it’s not cleaned properly it can leave stains and can spread bacteria. That’s why cleaning it up as quickly as possible is important. The good news is whether your stain is fresh or old, there’s a solution available for you to get rid of that yucky cat smell. Try to blot up as much urine as you can using the paper towel. Trust me; this will make your job much easier. Use the clean paper towel and try to apply as much pressure as you can. Repeat the process until you feel there’s no more urine left to soak up. This step is strictly to be applied if the urine is fresh not when it’s already dried up. For best results, you can use cotton towels as they allow more absorption. You could also use old throw away towels instead of paper towels. Once there’s no more yellow tone to the liquid that’s being absorbed, it means the urine has been absorbed. After that rinse the area with clean water, you can also use the wet/dry vacuum to absorb the liquid. Make sure you always have necessary supplies available in your house for e.g. paper towels, cotton towels, water spray bottles, rubber gloves, wet/dry vacuum e.tc, and always be prepared for any surprises that your cat decides to throw in from time to time. Enzymatic cleaners are the most effective in getting rid of cat pee smell. They contain biological enzymes that break down the proteins in urine and sometimes completely removing the cat pee smell. Don’t use any other chemical before you use enzymatic cleaners. In that case, they may not work. It is recommended to use enzymatic cleaners before you use anything else to treat the stain and soak the area well. Follow the instructions given closely and let it dry for several days. In the case of using enzymatic cleaners, you may not have to do anything else. If enzymatic cleaners weren’t completely successful in eliminating the cat pee smell; it’s recommended to use the vinegar solution. Spray the soiled area generously even beyond the soiled area to be sure to remove all urine. Make use of UV light or a black light to check for the exact location of urine spot, you can see the urine glow in the light. Outline the ones that can’t be seen with naked eyes with chalk so that you don’t miss any traces. Scrub the vinegar solution into the stained area. You may use the bristle brush to scrub away the area until it’s completely soaked with the vinegar solution. 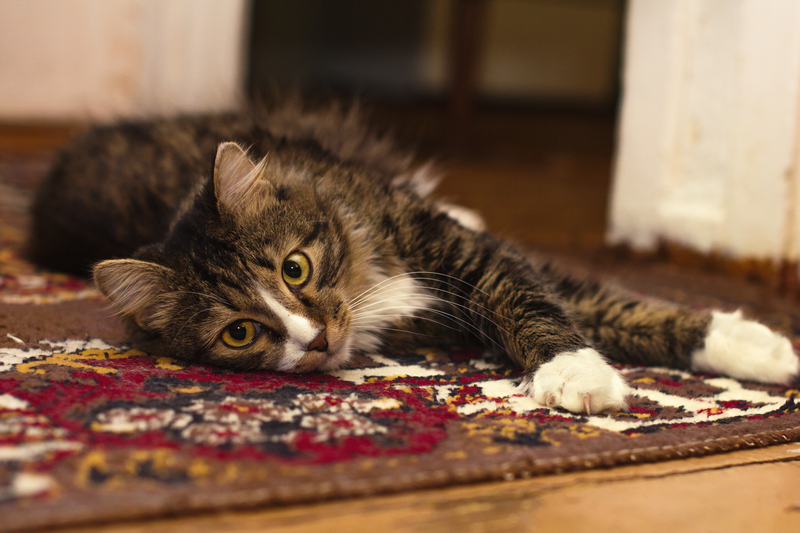 The vinegar solution will help neutralize the ammonia smell in your cat’s urine. Again make use of paper towels or clean rag to blot as much as vinegar solution you can. Let the area air dry. Clean the infected area with a household cleaner that doesn’t contain ammonia as cats find its smell pretty much like urine. Wipe the soiled area with clean water. In a spray bottle add 10 parts of water to 1 part of bleach. Spray the soiled area. Let the bleach sit for 30 minutes and then clean the infected area with a damp cloth. Put on rubber gloves before spraying bleach to the soiled area. Be careful about the area where you use bleach as it may damage or change the color of some materials. If you find your clothing smeared with cat’s urine, mix one cup (60 ml) of apple cider vinegar to the laundry detergent in your regular wash. If you still find urine’s smell you can also add the enzymatic cleaner to your wash.
Dry cleaning may be necessary. If you can’t totally eliminate the smell or stain out of an item, you may have to discard it. Baking soda is a natural cleaner, deodorant, and odor absorber. Just sprinkle some on the soiled area. Mix half a cup of 3% Hydrogen peroxide with one tsp. (5ml) of dish detergent and pour it over baking soda. Use a scrub brush to rub the solution into baking powder. And VOILA! you will be amazed by the telltale results of baking soda. Finally, blot the area and let it dry. Vacuuming the soiled area is best to remove urine particles or particles of any solution you applied to the area. Wet vacuums work the best as they best soak the area and then vacuum the water back into vacuum’s water tank. Avoid using steam cleaners; the high heat they produce will actually set the stain. For best results always prefer using the wet vacuum with cool water in the vacuum tank and pay careful attention to manufacturer’s instructions.